The British Museum is home to some of the most important and impressive artifacts from the ancient world. The Rosetta stone from Egypt allowed us to decipher the hieroglyphs of Ancient Egypt, the panels from the walls of the Assyrian royal palace at Nimrud show allow us deep insights into Assyrian culture and gives us glimpses of biblical events from the eyes of “the bad guys”. The list goes on. My favorite object, however, is a Roman glass cup. The Lycurgus Cup, so-called for the narrative it displays, is a true example of Roman creative genius. The cup is one of the few remaining examples Roman diatretum or Caged-Cup. This is where the surface of the glass is ground back and intricately cut to create a “cage”, formed by the original surface of the glass becoming, in essence, a separate entity from the new surface of the body of the cup. 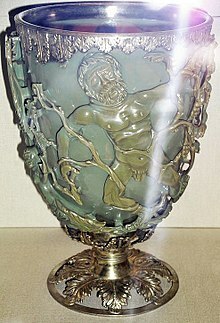 The Lycurgus cup is unique in that it is the only figurative example of this type of glass work that remains intact. Other caged-cups exits but are instead (but no less impressive) a series of geometric patterns. The Cup tells the story of Lycurgus, Thracian King, who outlawed the worship of Dionysus, the god of wine. There are several versions of the story but all have the same basic narrative. In general they claim that Dionysus punished Lycurgus with madness. One version says that, in his madness, Lycurgus thinks his son is a grape vine (sacred to Dionysus as god of wine) and kills him by pruning his extremities causing the land of Thrace to become parched through disgust at this act. A second version, the one engraved on the cup, claims that Lycurgus tried to arrest a follower of Dionysus called Ambrosia. Dionysus turns her into a grape vine which wraps itself around Lycurgus and eventually kills him. 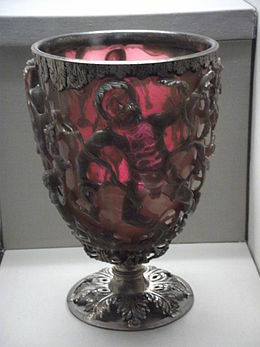 What makes the Lycurgus Cup even more unique is an effect it produces when exposed to light. The Cup, when viewed normally, is a dark shade of green. When placed against the light, however, the colour turns to a shade of pink. This is due to a technique which displays the skill and ingenuity of late Roman craftsmen. This is called a dichroic effect and is created by mixing small amounts of gold and silver dust into the glass mix. At roughly 330 parts per million of silver and 40 of gold the metal in the glass acts as a filter for various colours in the spectrum. This is due to the coarse nature of the gold and silver particles which scatter the lights from the blue end of the spectrum but not the red leaving the Cup with an ethereal pinkish/reddish glow. Cup comes from the later Roman period, somewhere between the 3rd and 4th century AD. Some have claimed that the Cup comes from Rome but the most likely option is that it comes from Alexandria. Alexandria was famed throughout the Roman Empire for its glass manufacturing and the amount of skill involved in making the Lycurgus Cup makes it likely that the artisan was, at the very least, trained in Alexandria. The prominently Greek theme also adds to the likelihood of Alexandria being its place of origin given the dominance of Greek culture in the Eastern Mediterranean. Following the death of Alexander the Great his generals, the Diadochi, had split the Empire into several parts, each encouraging Hellenisation in their respective kingdom. Egypt was taken by Alexander’s general Ptolemy who had promoted the cult of Alexander in Egypt where the great Macedonian king was laid to rest. To Alexander, Dionysus had been one of the most important gods of the Greek pantheon, his mother’s patron deity. Dionysus had also established quite a culture among the heavy drinking Macedonians in general and so the spreading of his cult to places like Egypt was inevitable. 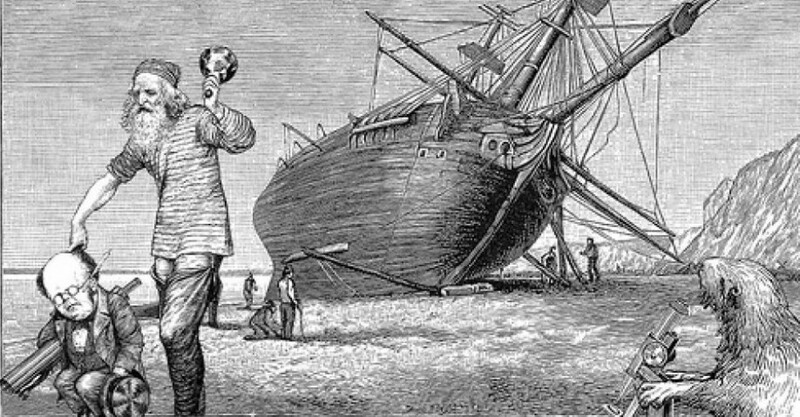 The history of the Cup is largely unknown. From its near immaculate condition it is likely that it was generally kept in safe storage and not part of a buried treasure hoard (where it would be exposed to the elements). There are theories that it could have been part of a church collection which was then pilfered in the anarchic days of the French Revolution (a theory based on the gilt bronze rim and foot which are thought to be later additions, dated to the 1800s). Alternatively it could have been buried in the sarcophagus. We do not know when the Cup was unearthed. Our first reference of it comes in 1845 when a French writer described it as “being in the hands of M. Dubois”. The next we hear of the Cup is as part of an exhibition at the Victoria and Albert Museum in London in 1862, this time as part of a collection loaned by Lionel De Rothschild. However, after the exhibition the Cup once again disappeared from the historian’s radar. The Cup finally reappeared in its final resting place, the British Museum who bought it from Victor, the Lord Rothschild in 1958 for £20,000. At the BM it has attracted a large amount of attention as an example of the fine quality of Roman craftsmanship although it is still overshadowed by many of the other amazing artifacts on show.